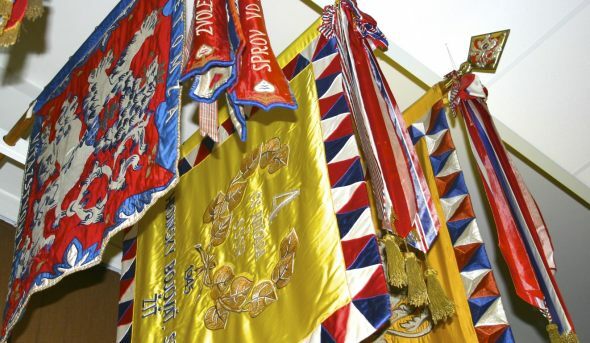 Our experience with preserving of flags is very long as the tradition of flag-making has been developing in our family firm for 300 years already. Furthermore, the precision of our work is often mentioned in our customers' references. When preserving the condition of the flag as it is, no additional embroidery work is done. It means that loose threads are fixed, and the flag is cleaned and stabilised in the present condition to survive for future generation. In this case, we recommend using it and storing it only under special conditions. All the preserving jobs are done under supervision of the restorer certified by the Ministry of Culture CR. During the preservation procedures, latest knowledge and techniques in the area of restoration and preservation of textiles are applied.